Boxbird was set up in February 2008 by print enthusiast Alice Teague and illustrator Graham Carter. It's one of the premiere online galleries for new talent, showcasing some of the UK’s finest illustrators, printmakers and fine artists including Fiona Hewitt, Sally Elford and Ben Newman. 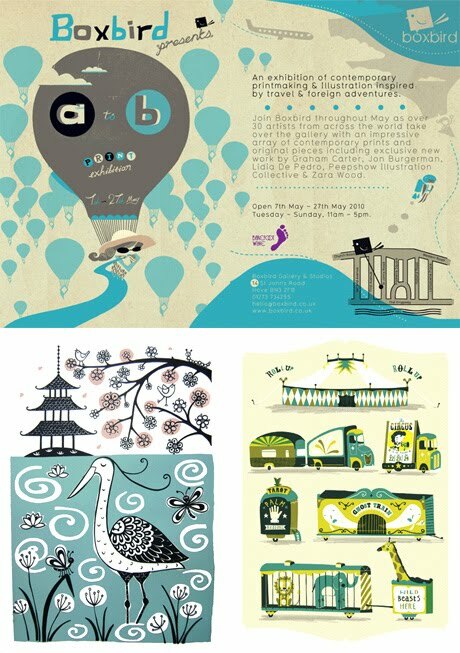 They also organize offline exhibitions and one is soon to be opened: 'A to B', an exhibition of contemporary printmaking & Illustration inspired by travel and foreign adventures, from Friday 7th May - Thursday 27th May 2010. The show will be jammed full of affordable limited edition prints and original art works all of which are hand made or hand printed. Anyone heading to Brighton? Have you ever heard about Russian stray dogs?